Long slender pseudobulbs topped by a pair of hard, succulent leaves arise from a creeping rhizome. 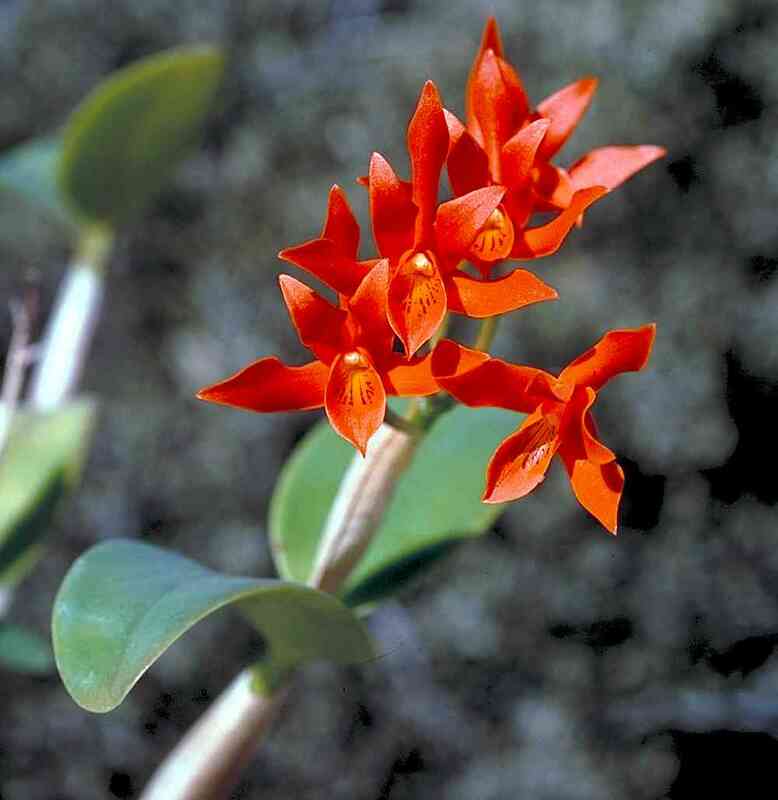 In spring clusters of half a dozen or more one-inch bright orange flowers emerge from sheaths between the leaves. They are pollinated by hummingbirds. The one known Sonoran population consists of several colonies about a meter across on large rocks in deep shade above a stream in a large riparian canyon with evergreen tropical vegetation surrounded by tropical deciduous forest at 800 m. In fact, this site, Arroyo Verde, is one of the most mesic, "tropical" habitats in the state. Southward to Guatemala. Cattleya (sensu lato) is a genus of 30 species of Central and South American orchids. This is the only one that ranges into Mexico, so it is remarkable that it extends all the way to Sonora. 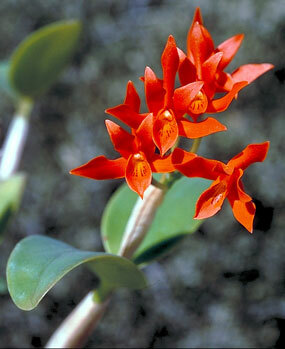 Most Cattleya species have large (to 8 inches diameter), white to lavender, bee-pollinated flowers. 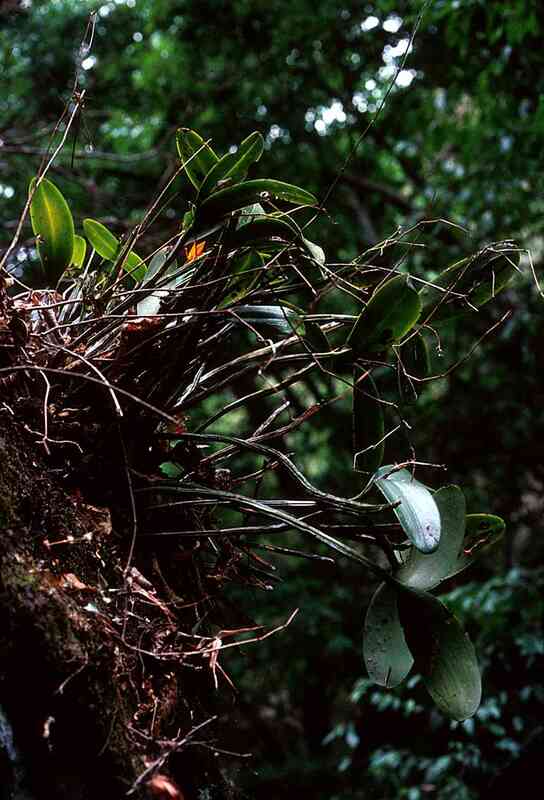 It was largely this genus that triggered the orchid collecting mania that began in 19th century Europe, and their resulting hybrids with species in related genera became the classic corsage orchids of the 20th century. Description: Forming dense colonies on rock; rhizomes short, the pseudobulbs more or less terete, 22-28+ cm tall, ca. 1 cm diameter, tough and semisucculent, covered with several papery sheaths. Leaves 2 and opposite (or 3), terminal, 12-14.5 cm long, 3.8-4.2 cm wide, elliptic-oval, thick, green, semisucculent, evergreen. Developing inflorescence protected by a pair of foliaceous bracts ca. 5.5 cm long, the peduncle 8 cm long, with six or more flowers. Flowers brilliant orange-red (occasionally yellow in southern populations), erect, the pedicellate ovaries 4.5 cm long, the perianth campanulate (not "opening wide"), the longer tepals 2 cm long. Fruits 8.5 cm long (including the pedicellate stipe), the body ellipsoid, 5 cm long. Flowers in May; fruits apparently ripen in late winter.